So You Want To Fly A Wingsuit? We don’t blame you - it is mesmerizing. We all have fallen into the rabbit hole of wingsuit videos, but sitting on your couch won’t get you closer to doing the real thing. We talked to some of Cross Keys’ own wingsuit specialists to learn more about the fascinating discipline and what you need to do to get there. Here’s what they told us. Wingsuiters will tell you it’s like nothing else out there. You’ll soar through the air, achieving distances and speed you would have never dreamed of. Wingsuiters can get forward speed of well over a hundred miles per hour soaring through the sky while having a decent rate a third of normal freefall - that’s three times more freefall! This is the closest you can get to soaring like a bird. Part of what makes wingsuit videos and photos so mesmerizing is the seeming effortlessness. They seem to be just floating peacefully and easily through the sky with the instincts of a bird. But in reality, there is a lot more training, knowledge and practice that goes into it. To start training for your first wingsuit flight, you need to have a minimum of 200 jumps behind your back, and a variety of skills to tackle the wingsuit and the added inherent risks that come with it. Take one step at a time and enjoy the ride! Most people start skydiving without any long term goals, they just want to learn to jump! But some come in with a very specific goal in mind - like wingsuiting. It’s totally acceptable to have long-term goals early in your skydiving career to keep you motivated - but be sure stay grounded in reality. Take your time, learn the essentials of skydiving and have fun! If you are just starting out, first focus on getting your "A" License, which takes some ground training and 25 jumps. Once you have your "A" license, go have fun and keep learning! Jump with as many different people as you can, and safely familiarize yourself with other disciplines of freefall. Relative work ("belly flying"), freeflying, tracking, and excellent exits are all essential skills you need to become a competent wingsuiter. And of course, don’t forget to work on your canopy piloting skills - you still need your parachute to land safely! 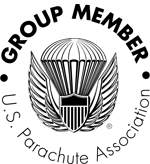 Before you are ready to wingsuit, make sure to hang around the DZ and talk to other wingsuiters. Learn about what they do, how they got into it and any other tips they may have. Like with any aspect of skydiving, our community is an essential key to the learning process. Once you have a minimum of 200 jumps, you can sign up for a First Flight Course at your dropzone. Just like before, take it one step at a time, and work with a qualified coach to make sure that you master all the safety related skills. Once you start learning, you still won’t be wearing the same suits you see while binging Youtube videos. Start off conservatively with a small beginner wingsuit. Keep learning from more experienced wingsuiters, fly as often as possible, and be patient. Most large dropzones also offer intermediate and advanced wingsuiting courses and camps. Make sure to invest in them to develop your skills, and soon enough you’ll be soaring through the airs like a pro! Not a skydiver yet, but itching to put on a wingsuit? Take the first step and book your tandem jump today, that's how you get started pursuing your dream!